A sunny summer blog post from San Diego! As I was putting together my beach bag and tossing in the essentials such as sunscreen and a good book, it made me wonder what a ‘summer read’ was in the middle ages. What books were available to a medieval reader that might reveal what they read at certain times of the year? Especially the summer? In various time periods this text was the Psalter, Breviary or Book of Hours. These books were easily held, portable, primarily for personal use, and often richly decorated with depictions of the progression of time in the liturgical year, including scenes of summer. There is no definitive changing point from one type of book to the other, but more a synergy between the three forms. The Psalter is often described as the back bone of the Breviary, while the Book of Hours is a reflection of both styles of texts. In the early middle ages the Psalter (an independent book of psalms often with a calendar, canticles, antiphons, and texts for the Divine Office), guided the monk or nun through their daily prayers. Coming together eight times a day, the religious community followed a set schedule of chants and prayers which corresponded to certain times of the liturgical year. 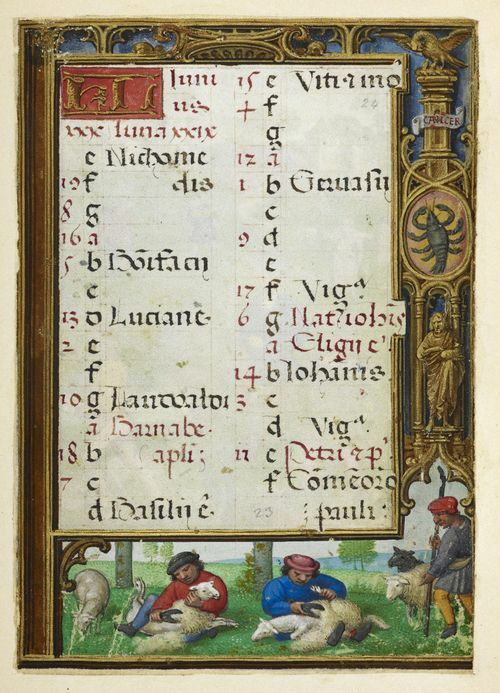 Here we can see a depiction of the month of June in a calendar page from a twelfth century psalter, showing the equivalent zodiac sign and labor of the month. 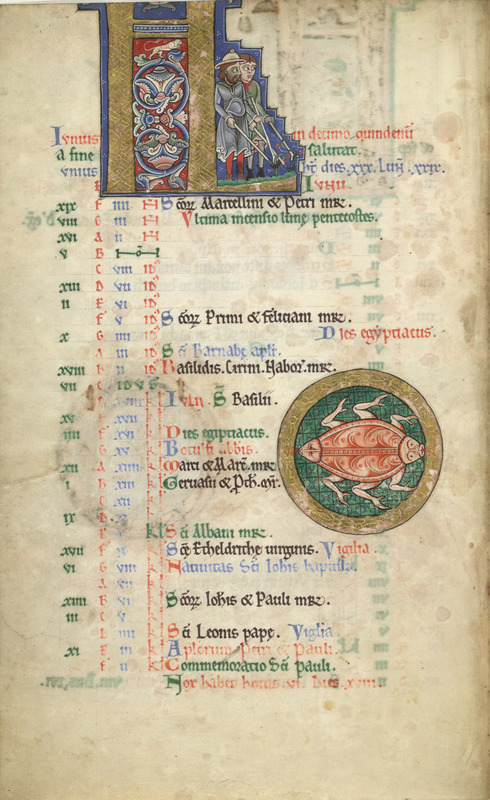 By the 13th century, the Psalter developed into the Breviary, which combined the readings, prayers, and vocal music used in the Divine Office, plus adding variant texts regarding feast days for each season of the year, into one book intended for priests or sometimes noble patrons. As you can imagine, it could be very large, decorated with miniatures, historiated initials and marginal images, and thus an expensive (and cumbersome) book. Therefore, it was often divided into two volumes; the winter volume, roughly from Advent to Lent, and the summer volume, from Easter through the rest of the liturgical year. 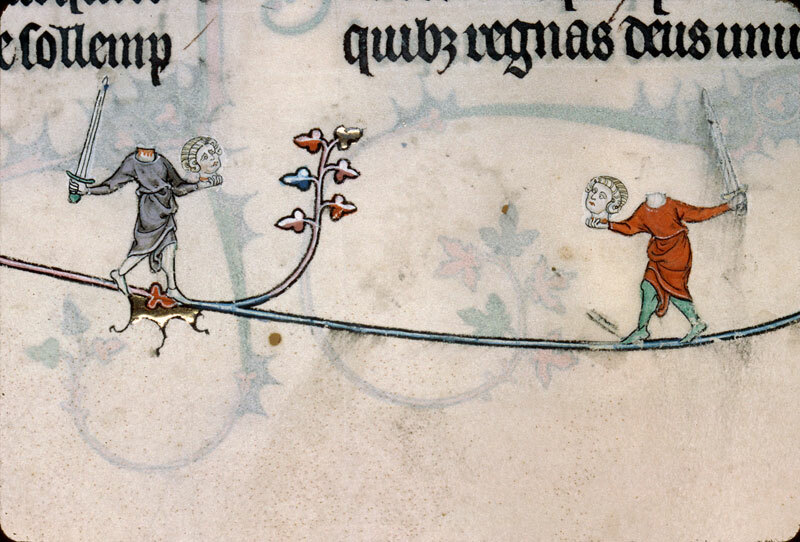 Here we see an image from the summer volume of the Breviary of Renaud/Marguerite de Bar, Metz ca. 1302-1305, perhaps depicting a summer jousting or sword fighting competition; apparently, you can lose your head in the summer heat! Often called the medieval bestseller, in the fourteenth and fifteenth century the Book of Hours became increasingly popular to the laity with its simplified treatment of the Divine Office. It helped to organize time throughout the year and to structure private daily devotion. Essentially an abbreviated Breviary and similar to a Psalter, a Book of Hours was a customized devotional text for the lay reader. A central part is the Hours of the Virgin, with hymns, prayers, and readings to be recited during the eight canonical hours of the day. It might also contain images of the labors of the month, zodiac signs, a calendar indicating both popular and regional feast days, and other illustrations for the purpose of personal meditation. Here we can witness a scene from summer, the shearing of sheep. These are just a few examples of what a medieval book owner may have read in the month of June and a small reflection of how they ‘read summer’. What is on your summer reading list?